Glam Morena: Tutorial: So Much Flare. A few weeks ago I won a Sigma Eyeshadow Palette from Twitter. Hooray! I decided to go with the Sigma Flare Eyeshadow Palette since I tend to wear shades like that the most. Lately this is the palette I've using and this is also my favorite look to create with this particular palette. A review and swatches are coming soon! Soooo pretty, love that pop of mint! I love this look on you! I am so glad you got the Flare palette. 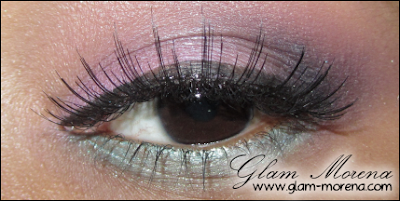 :) That seafoam-y green on the lower lashline is stunning! this look is gorgeous, love itt! !